The 26th United European Gastroenterology (UEG) Week 2018 will be held at the Austria Centre in beautiful Vienna from Oct 20 – 24, 2018. At this year’s event, you will learn about some of the most recent, exciting developments in our field. There will be abstracts, posters, hands-on-training and live case transmissions to 13,000 expected attendees, linking people in the GI community from nearly 120 countries. Be sure to visit the Cook Endoscopy Team at Booth #24, Hall X2. As always, we treasure these international congresses because they provide a great opportunity to meet so many of you face to face. We’d love to show you our latest product innovations and discuss the challenges and vision for the future of endoscopy. Come by the hands-on training area of our booth and you can experience navigating pancreaticobiliary strictures with our most advanced Calibrated Tip Wire Guide yet, The Acrobat 2. Really put your ERCP skills to the test with our popular ERCP Training Model, which was invented with Prof Guido Costamagna, Head of the Digestive Endoscopy Unit, and Dr Ivo Boskoski, Consultant Gastroenterologist, both of Policlinico A. Gemelli, Rome. The ERCP Trainer replicates pancreaticobiliary anatomy, allowing physicians to gain important experience in the fundamentals of ERCP and endoscope techniques, as well as to hone cannulation and sphincterotomy techniques. We were delighted to recently receive authorization to market Hemospray in the USA! This is a major milestone for Cook Medical because now we can give our USA physicians an important new tool to treat GI bleeds, as they have been in other parts of the world. We would like to personally invite you to try this innovative, game-changing hemostatic powder for yourself. Join us this year in celebrating Cook Medical’s 20th anniversary in the field of EUS. We entered the EUS market in 1998 with our first endosonographic needle and have been working ever since to continuously expand the capability of EUS procedures with the ultimate goal of improving patient care. We really look forward to meeting you at UEG 2018. Don’t forget to join us on Twitter @Cookgastro #UEGWeek where our team will be Tweeting live from the congress with exciting updates. 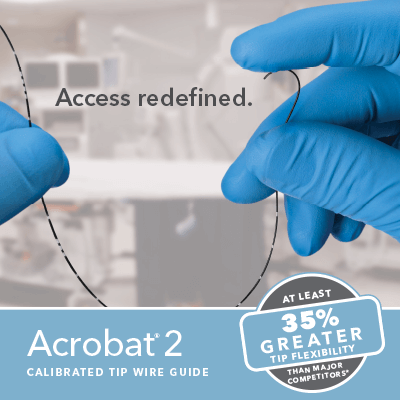 * The Acrobat 2 has at least 35% greater tip flexibility than the 8 major wire guides tested, benchtop test data on file at Cook Medical.